The explosion occurred inside the church located between the U.S. and Chinese embassies in Islamabad Sunday morning killed four and wounded 40 at least, according to police sources Islamabad. Pakistani President Pervez Musharraf condemned the attack by saying the nefarious act was aimed at sabotaging the interest of Pakistan at a time when country was actively engaged in eliminating terrorism. The explosion at a church in Islamabad Sunday morning killed four and wounded 40 at least, according to police sources Islamabad. The blast occurred inside the church located between the U.S. and Chinese embassies in the diplomatic enclave. 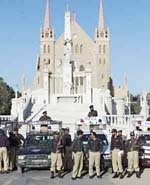 The persons who were injured during the grenade attack in a church in the Pakistani capital of Islamabad on Sunday morning have been timely sent to hospitals for treatment, an official document said. "On receiving information, the District Administration and Islamabad Police immediately rushed to the spot and condoned off the area. The injured were immediately evacuated to the city hospitals," said a press note from the Government of Islamabad Capital Territory of Pakistan. It said that at 10:50 a.m. Sunday a person entered the Protestant International Church situated at the Diplomatic Enclave in Islamabad and hurled a numbers of hand grenades on the congregation, resulting in the death of five persons and causing injuries to 42 individuals. Among those who were killed were one Pakistani, two Americans, one Afghan and one unidentified person, according to the press note. The injured included citizens of the United States, Iraq, Afghanistan, Germany, Sri Lanka, Switzerland, Britain, Australia, Canada and Pakistan, the press note said. Of the injured, the condition of 6-7 persons is serious. The individuals who sustained minor injuries were discharged from hospital after receiving medical aid. Police has begun investigation and additional security staff have been deployed on duty, the press note said. Pakistani President Pervez Musharraf here on Sunday condemned the attack at a Protestants' church in Islamabad, saying the nefarious act was aimed at sabotaging the interest of Pakistan at a time when country was actively engaged in eliminating terrorism. Musharraf said he was saddened by the outrageous act of terrorism in which five worshippers busy in Sunday mass at the International Protestants' Church in the diplomatic enclave were killed and several others were injured, according to the Associated Press of Pakistan. He said that he had ordered the security agencies to launch a coordinated hunt to track down the culprits involved in the dastardly attack. He said that those involved should be unearthed so as to know on whose behest they committed the ghastly act of terrorism, as these criminals clearly were no friends of Pakistan. At around 10:50 hours, one or two attackers barged entry into the church and attacked with hand grenades on the worshippers, Islamabad police sources said. "Two of the four grenades hurled on the worshippers, went immediately off that killed five and injured 45 others of total present 60 to 70 people in the Church," the Islamabad police chief Nasir Khan Durrani said. He added, "Majority of the victims are foreign nationals who were attending a Sunday service at the time of the grenade attack." He did not rule out the possibility of foreign hand behind the incident and said it was a clear attempt to sabotage the interest of Pakistan. The police have recovered two live hand grenades from the scene, maker and brand of which are being ascertained. Pakistani Health Minister Abdul Malik Kasi was quoted as saying that an American woman and her daughter, aged around 17, had been killed, while the husband was being treated for leg injuries. A diplomat in the U.S. Embassy here confirmed that two Americans were among the dead. Islamabad police chief Nasir Khan Durrani has expressed apprehensions that the attackers at the church may also be included among the injured or killed. When asked by local journalists whether there was any arrest in this regard, he said no arrest immediately could be made while investigations were in progress at a pace.